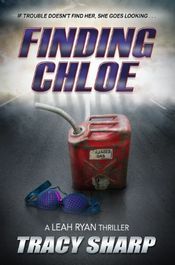 MystereBooks is pleased to feature Finding Chloe by Tracy Sharp as today's second free mystery ebook (A Leah Ryan Thriller; Kindle format only). This title was listed for free as of the date and time of this post, February 28, 2014 at 6:45 AM ET. Prices are subject to change without notice. The price displayed on the vendor website at the time of purchase will be the price paid for the book. Please confirm the price of the book before completing your transaction. An exotic dancer vanishes from the underbelly of the city. Repo agent and reformed car thief Leah Ryan has a knack for rescue, and she's a sucker for a lost cause. Unable to turn away from helping find a stripper whose disappearance many are indifferent to, Leah soon discovers that there are those who would keep Chloe Nolan from being found, and that there is far more to her disappearance than meets the eye.